My church meets in a community center. We sit on folding chairs most often arranged in a semi-circle but occasionally placed around tables so that we can talk and pray together during worship. We have more babies and toddlers than floor space in the nursery so families are encouraged to bring their wee ones with them into worship. I once saw a baby lovingly passed from one person to another down the row, across the aisle, and back again. Cuddling a baby during a reading of Psalm 139 is a wonderful thing. My friend Diana’s church meets in a large building located a few kilometers away. The 800 plus members sit on red cushioned pews placed in a permanent semi-circle on the sloping sanctuary floor. A brown wooden cross hangs on the wall behind the pulpit and after worship the congregation gathers for beverages along the right side of the gymnasium while the young people shoot hoops in the left side. The more senior members take their coffee to a room nearby. Dodging basketballs is difficult when you’re 85 years old. My faith has been formed through the relationships I have with the people in both of these churches. Both congregations contain dynamic, dedicated staff and volunteers with a heart for ministry. Each of these churches also has its own church culture—one that is shaped by its building, its history, its neighborhood and its people. Your church has its own culture too. As the Creative Resource Developer for Faith Formation Ministries, a ministry of the Christian Reformed Church in North America, my job is to create and curate resources that will encourage and equip congregations and their leaders in their calling to practice intentional, lifelong discipleship and faith formation, with an emphasis upon children, teens and young adults. You could say that I’m part of a “maker culture” that is supporting the needs of “church culture”. I imagine that in your role in ministry you’ve also had to be a creative resource developer from time to time, creating and curating materials for your church. If so, you’ve probably experienced feelings of disappointment when someone put the kibosh on the exciting idea you were eager to try; frustration when a resource that worked wonderfully in your colleague’s congregation fell flat in your church; and anxiety after of a Saturday spent searching for something—anything!–to use on Sunday morning because you just realized it is [special something] Sunday and you had nothing planned. Selecting, using and choosing resources that fit takes work. Wondering about ways to become a more intentionally intergenerational church and looking for ideas to help you cast that vision in your congregation? There’s a toolkit for that! Open the Intergenerational Church toolkit and check out the Belonging and Becoming tabs. Wondering how several generations might serve together? Along with inspiring stories and a tool for assessment you’ll find a list of 25 Ideas for Intergenerational Service under the Serving tab. Exploring starting intergenerational small groups or offering all-ages large group events? Go to the Learning and Growing tab. Want to determine the strengths upon which your church can build as you plan worship services in which everyone belongs and everybody serves? Get started with the Intergenerational Worship Survey found in the Worshipping section. There’s also a toolkit for Welcoming Children to the Lord’s Supper. It’s filled with downloadable resources that include stand-alone Sunday school sessions, a communion course for families, a bookmark that all ages can use at home, ideas for communion blessings for children, children’s messages and more. 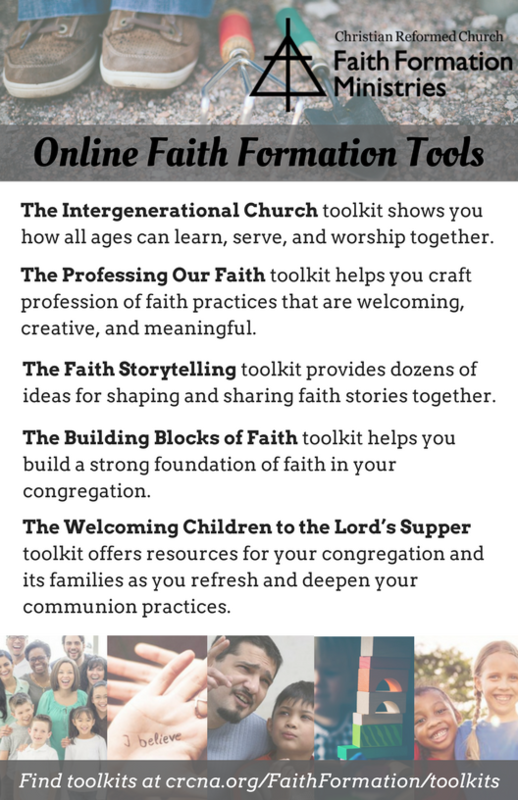 The Faith Storytelling toolkit contents will help your congregation develop a faith storytelling culture; the Building Blocks of Faith toolkit provides easy to understand language for strengthening a faith formation culture; and the Professing our Faith toolkit contains practices to help you shape a church culture in which members feel encouraged to affirm their baptism as they publicly profess their love of and commitment to Jesus. There you have it. Hundreds of tools created, curated, and ready to be shaped by ministry leaders for use in their unique culture—in churches like mine, in churches like Diana’s. And in churches like yours. Karen DeBoer is the author of the Home Grown Handbook for Christian Parenting and the contributing editor of God’s Big Story cards and You’re Invited: A Week of Family Devotions on the Lord’s Supper. 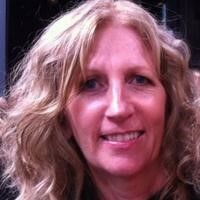 She makes her home in Kitchener-Waterloo, Ontario.